DCU Fencing competing in Cork. DCU Fencing recently took part in their first competition of the year, travelling to Cork to compete in the Schull Novice Cup. “Every fencer must have a total of less than two years of experience to give beginner fencers a chance to fence people of a similar skill level,” Brigita Armonaite, captain of DCU Fencing Club, told The College View. “We were all very pleasantly surprised in the end. In total, we had 3 female fencers and 4 male fencers competing at the Schull Novice Cup. “The highlights of the weekend came from our men’s and women’s épéeists during the poules. Kevin Ledwith was ranked 6th out of 23, and Clodagh O’Donnell was ranked 3rd out of 17. “Both fencers were total beginners, so naturally we were all absolutely delighted with their results,” Armonaite said. The club itself have a mix of beginners, the likes of whom competed in the Schull Novice Cup, along with more experienced fencers. Most fencers in the club are beginners though, largely due to fencing not being a very common sport. “We have a good mix of both total beginners, and experienced fencers. Fencing isn’t a very common sport unfortunately, so most of our fencers are absolute beginners. “As a result, our coach runs our weekly lessons by starting everyone from scratch,” Armonaite explained. Armonaite explained what their lessons consist of, from a warm up, fencing moves, to practice bouts. “The first few lessons of the year consisted of the absolute basics: a proper warm up, footwork, the correct fencing stance, lunges, and how to parry and riposte (a defensive action followed by a counterattack). “The lessons end with a series of practice bouts, where beginners get a chance to try out what they learned, and observe more experienced fencers,” she said. 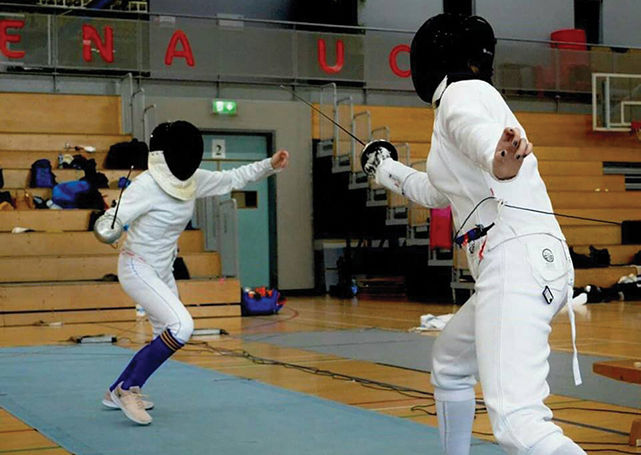 DCU do have fencers who fenced before coming to college, and Armonaite explained the role they can play in the club and the level of competition they compete at. “We also have a few more experienced fencers who have fenced for years before college. It’s always fantastic to have them around simply due to the invaluable advice they can provide. “They also represent DCU at higher level competitions, and at the Intervarsities,” Armonaite said. The Intervarsity Fencing Championship, held in March in NUIG is the biggest event of the year for DCU Fencing, while they are also looking to host their own competition, The Winter Blade. “The biggest and most exciting event of the year by far is the annual Intervarsity Fencing Championship, which will be hosted by NUIG in March. “Having attended the Fencing Intervarsities for the past two years, I can definitely say that this particular competition is a must for any student fencer,” Armonaite said. “Other than that, we’re looking forward to the two Novice Cups in Maynooth and Galway, and the East of Ireland Open. “We’re also interested in hosting our own competition, The Winter Blade, however that is still a work in progress at the moment,” she said. Club captain Armonaite explained that their main goal is currently working towards the intervarsities, in NUIG, a competition DCU have performed well at previously. “We have a fantastic coach, and a great team lined up. We feel quite confident about our experienced fencers, and are excited to see how they’ll perform in future competitions.